Zwift, the global online training platform for cyclists, runners and triathletes, has confirmed the launch of its eCommerce store at zwift.com/shop. Positioned as a one-stop shop for indoor training, the store includes Zwift certified bike trainers, training accessories and apparel ‘designed in Watopia’. The eCommerce store is now live for the North American market for all hardware, accessories and apparel purchases. Zwift will also ship Zwift Run Pods, clothing and accessories to over 55 countries internationally. Further localised roll outs will take place over the coming months with dedicated stores for the UK, Europe and Australia. Ahead of the dedicated local stores going live, international buyers can purchase anything from the store (with the exception of trainers), but there are international shipping costs. For a lot of products these are currently subsidised until the local stores roll out in the UK, Europe and Australia. For new Zwifters, the eCommerce store will aim to ‘simplify the purchasing experience, offering training solutions to meet all needs and budgets.’ All trainers sold via the eCommerce store will come Zwift Certified. Trainer brands available from launch on the Zwift online store will include Tacx, Wahoo, Cycleops, Elite and Kinetic and will be offered with $0 down, 0% financing options. “There’s a great deal of choice out there nowadays, which is fantastic for the customer,” said Jeff Veldhuizen, VP eCommerce at Zwift. “Sometimes though, this choice can become confusing – there’s a lot of information to digest. “We wanted Zwift.com to be a one stop shop for your home training needs. You can be confident that every trainer we sell will deliver a great Zwift experience. We also aim to deliver a bit more clarity on the differences between things like wheel-on or wheel-off trainers, and clearly outline exactly what accessories you may want to consider. Alongside home trainers, www.zwift.com/shop will also be retailing a wide ranging selection of training accessories from Run Pods and heart rate monitors to fans and apparel. “We’ve seen a strong appetite for Zwift branded merchandise amongst from the Zwift community, and have been working quietly behind the scenes to source quality partners to allow us to deliver this proposition,” added Jeff Veldhuizen. 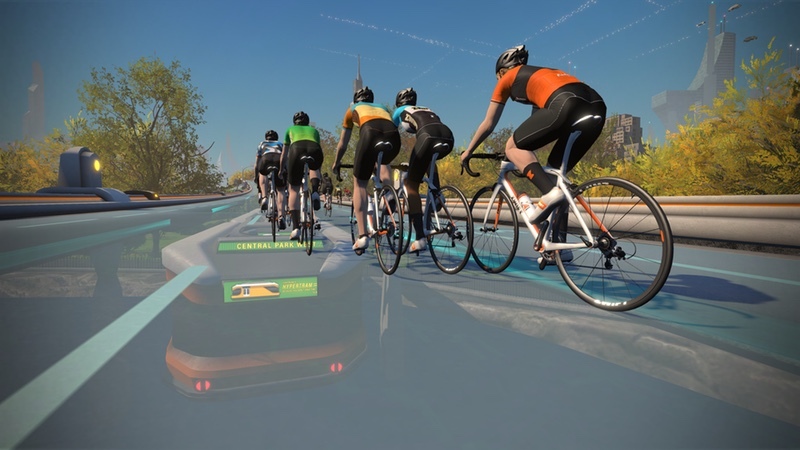 “We will also plan to offer limited runs of kit available for Zwifters to purchase upon completion of Zwift in-game challenges – another a great excuse to ride. For the first time, you can actually make ‘the real you’ look like your avatar!